Extra Special: Arizona Lifts Gun Limits! 16 YEARS IN THE MAKING! 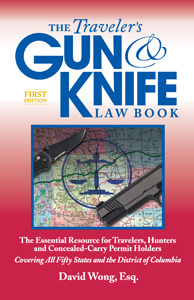 If there's no guide available for your specific state, this is the book to own. the first in the nation. Is your state next? Let freedom ring! Arizona, which has single-handedly rocked the national dialog on the immigration debate, has done it again -- this time for guns. On the same day that portions of Arizona's controversial immigration bill SB1070 took effect, July 29, 2010, the Grand Canyon state implemented its new Constitutional Carry law. Under this groundbreaking new act (SB1108), any law-abiding adult in the state -- not just residents -- can carry a firearm discreetly without a government permit or red tape. 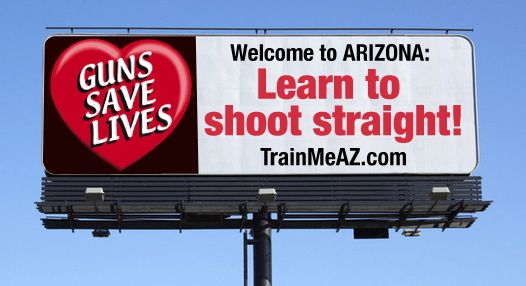 A statewide billboard and advertising campaign launches this summer, promoting marksmanship, firearm training and responsible legal gun use for every person in Arizona. Arizonans have been free to carry firearms in a visible holster, without government approval, since statehood in 1912. “Discreet carry” advances personal freedom, though critics fear the increase in rights will lead to an increase in crime. That deep-seated fear has accompanied every advance in the right to keep and bear arms -- from CCW-permit carry that swept the nation, to repeal of many so-called gun-free zones, such as the National Parks -- and has proven false every time. 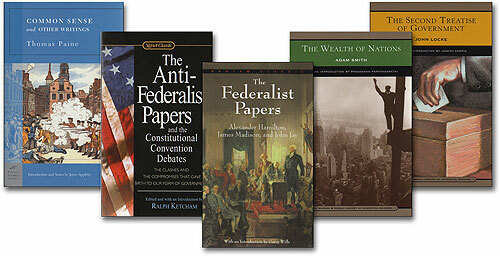 they are wholesome, decent, honorable, fun and very American pursuits. Americans used to take that for granted. Arizona is bringing it back. Have you been misled or confused about guns by the news media? reporting into one of the worst enemies American freedom faces. Passage of Constitutional Carry relied heavily on a relative newcomer, the membership-based Arizona Citizens Defense League, a lobbying and activist group dedicated to preserving and advancing the right to keep and bear arms. According to board member and spokesman Charles Heller, “Constitutional Carry was one of our goals when we organized five years ago, and it shows what can be done when hundreds of volunteers place their focus on popular concerns. The CCW permit was always viewed -- by those of us with an understanding of Arizona's Constitution -- as an intermediate step to get our rights restored. “Between our two registered lobbyists, our ability to apply pressure for the expansion of our rights, and with 25% of the state's legislators active members in our organization, we expect additional accomplishments in years to come.” AzCDL has become a power player worth watching. Anyone interested in advancing the work of this organization should join -- http://www.azcdl.org. Heller, in his 12th year as the host of Tucson's Liberty Watch Radio on KVOI, libertywatchradio.com/listen, can be reached at charles@libertywatchradio.com. One of the finest firearms training facilities on the planet, Arizona-based Gunsite, http://www.gunsite.com, is a supporter of the TrainMeAZ program. Gunsite, a 2,000-acre facility outside Prescott, Arizona, was founded by Col. Jeff Cooper, and trains elite military from around the world, law-enforcement officials and civilians. Cooper was perhaps the nation's foremost authority on defensive weaponcraft, and often called the father of the modern technique of handgunning. 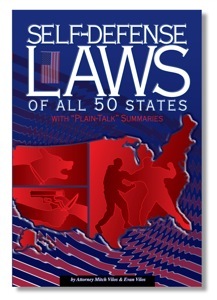 His book, "Principles of Personal Defense," is among the finest ever written on proper defensive mental conditioning, see it here: https://www.gunlaws.com/persafe.htm. News about all their classes and programs at Gunsite can be found on their website. A day spent at Gunsite is an education and experience that lasts a lifetime. Dateline PHOENIX -- An overcrowded Senate Meeting Room at the Arizona State Capitol on July 28 heard Sen. Russell Pearce discuss the values of the state's new Constitutional Carry law, and the TrainMeAz campaign designed to teach proper gun ownership, possession and use to the entire state. Pearce called Arizona the number one state for protection and exercise of Second Amendment rights, referring to the new Constitutional Carry law that eliminates government interference with the right to keep and bear arms, and by implication our new Defensive Display protection, Castle Doctrine inside and outside the home, strict statewide preemption, the Firearm Freedom Act, strong Burden of Proof that favors the innocent, ban on civil suits by criminals, even the nation's first knife preemption law that protects edged weapons and pocket knives. As soon as Pearce concluded his comments on SB1108 concerning guns, and left to attend to other business, reporters literally stampeded out of the room in an act of pack-media groupthink, to corner the Senator on his immigration law, which had just endured a court test. The remaining speakers at the podium, assembled for the most significant state-level Bill-of-Rights development in recent history, stood in shocked disbelief as a giant sucking sound emptied the room. Reporters and camera crews had no intention of covering Pearce's conference -- they were there for one agenda and one agenda only -- the fabricated racism they have injected onto a law designed to stem an alien invasion of the state. It was a stunning experience, and pulled the rug out from under the pro-rights supporters in Senate meeting room #3. We continued to a tiny smattering of people who didn't abandon the conference, mostly TrainMeAZ supporters and a lone video camerman. "Now that any decent adult in the state can bear arms discreetly, training should become as routine here as corn flakes," said Alan Korwin, an architect of the unique program. "We want to bring back the joy and righteous pursuit of marksmanship that used to be a hallmark of The America Way," he said. "We need to replace ignorance with education, change fear into empowerment, and bring honor and respect to grand traditions that have made this the most exceptional society the world has ever known." Unfortunately, anti-rights bigotry and people who detest those American values have done grievous harm to our traditions and core values. The shooting sports are the Number 2 participant sport in the nation. * So why have you heard everything there is to know about golf, which is only number three, and you've never even seen or heard the phrase Shooting Sports in broadcasts or in print in the "news"? That is a searing and self-evident testament to the utter bias and distortion perpetrated on the public by a prejudiced "news" media that runs an anti-rights (and anti-right?) agenda instead of reporting. According to leading experts, many of the people who discriminate against this portion of the Bill of Rights suffer from a medical condition called hoplophobia, a debilitating morbid fear of weapons. It's easy to be angry with them, but what they really need is medical attention, and they deserve pity. It's not their fault that they're sick, or that medical science has done little to help them, and most sufferers are in complete denial about their condition. They think hating guns is a good thing. They no longer realize it's not good to hate. Allowing hoplophobes to be involved in setting Second Amendment policy is like assigning people afraid of water to be lifeguards -- they'd never let anyone swim! The main treatment for hoplophobia is the psychological process known as "desensitization," the same methodology used for people with fear of spiders, open spaces or heights. You introduce the afflicted person to their fear, one very small step at a time, and they eventually overcome the terror if they're lucky. Gun owners everywhere have witnessed this phenomenon when they take a novice to the range for the first time. The doubts, trepidations, wondering, and even abject fear often melts away as the individual learns they can do this, it's safe, it's enjoyable, they're competent, and they no longer have need for the fear. If they hit a bullseye they get ecstatic! It's a beautiful thing, watching a person come out of that horrific shell of self doubt, and stand on their own two feet. This is why gun owners should always make an effort to take newcomers shooting. It's totally rewarding, defends our rights like little else can, and helps fellow human beings overcome that which holds them back. A main operating principle behind TrainMeAz is to get the entire public on the bandwagon and out to the range. What a marvelous state that would make us, the envy of the nation and the free world. Make it so." Thanks to the National Shooting Sports Foundation http://www.nssf.org for finding and providing this research, saving me time, and giving you much needed facts to counter the balderdash you get daily from the "news" media.